One of my favorite things about autumn is a steady supply of fresh butternut squash. Complimenting both savory and sweet dishes, often used in “pumpkin” pies, a sweet treat simply steamed with a touch of butter, it’s the quintessential fall vegetable. 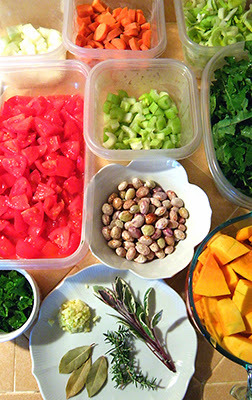 So when Alice Waters suggested, in her classic book The Art of Simple Food, to try butternut in place of zucchini to make a summery minestrone into a fall dish, I had to give it a whirl. Indeed, the soup is a delightfully autumn-like orange, and as full of chunky goodies as its warmer weather brethren. Using my Minestrone with Fresh Beans recipe as a base, I substituted butternut for zucchini, kale for spinach, and sage and rosemary for basil, thyme, oregano, and marjoram. I eliminated the pasta and could have substituted potatoes, but chose to simplify by sticking to the butternut for both squash and starch components. I also eliminated the tomato paste. Fresh beans are readily available now at farmers’ markets. 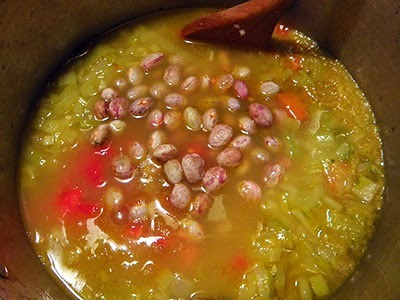 According to Dirty Girl Produce, Tongue of Fire beans are the classic minestrone beans. These look similar to the pinto beans in my popular post Cooking Fresh Pinto Beans. According to FoodSubs.com, cranberry beans, Tongue of Fire beans, and pinto beans are related and can be used interchangeably. Any beans that you can purchase fresh will taste better than dried, but dry speed-soaked beans will do in a pinch. Fresh cranberry or pinto beans, for which I’ve written the recipe, require 1 – 1 ¼ hours to cook. Adjust the recipe to accommodate the time your particular bean needs to cook, and add them at the appropriate time. 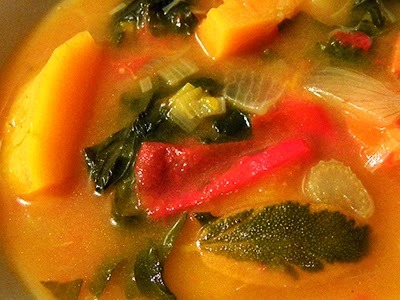 One key to successful autumn minestrone is not to overcook the butternut or the kale. I used large Red Russian kale, which can be pretty tough. I cooked it the same amount of time as the butternut, about 13 – 15 minutes. If you substitute Dino Kale or other softer variety, you could add it a bit later in the cooking process. 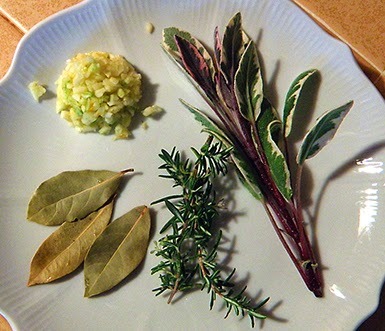 If you don’t have fresh sage and rosemary on hand, substitute dried—but cut quantities in half. 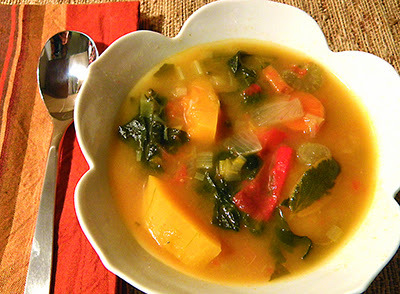 Enjoy this soup as we welcome the new season! In a deep soup pot, heat olive oil over medium high heat. Sauté onion, leeks, celery, and shallots until onions are golden and limp, stirring frequently. This will take about 5 minutes. Stir in garlic and sauté until fragrant, about 1 minute. Add carrots and stir to coat with oil, sautéing another minute or so. Add 8 cups broth or bouillon and bay leaves. Cover and bring to boil over high heat. Turn heat to medium low and simmer about 15 minutes, until carrots are partially soft. Add tomatoes and beans. Cover and bring to boil, then simmer for 40 minutes. While broth is simmering, strip kale leaves from stems and discard stems. Tear kale leaves into bite-sized pieces, discarding any tough leaf veins that you might find. 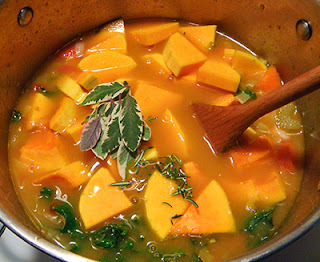 Add butternut squash, kale, and rosemary and sage leaves to soup. Stir in an additional 3 cups broth. Bring to boil and let simmer, covered, 10 more minutes. Stir in parsley. Cover and simmer for 3 - 5 minutes. Taste and season with salt and pepper as desired (I used ½ tsp. salt).